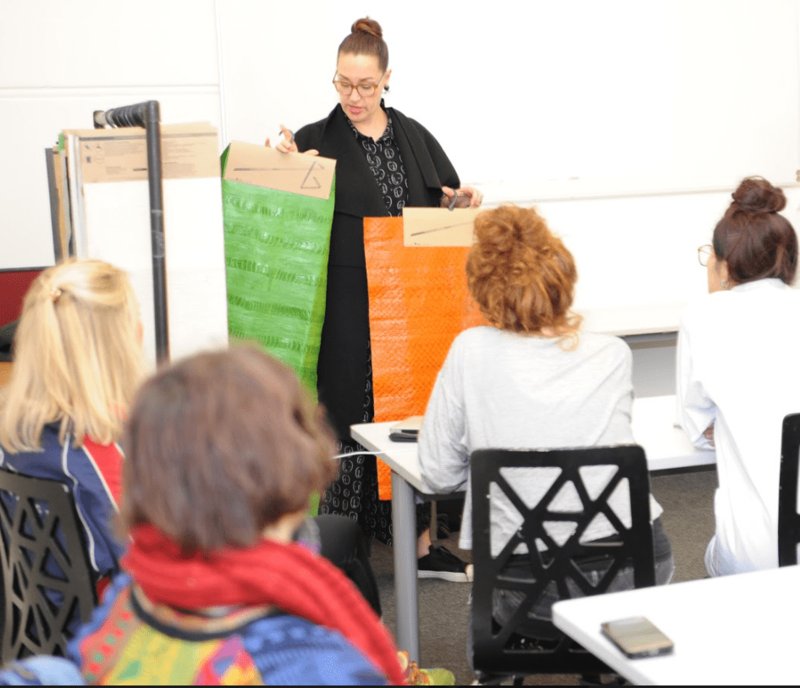 Last week The Sustainable Angle’s curator Amanda Johnston was invited by the London College of Fashion’s Cordwainers Accessory and Footwear to hold an interactive sustainable materials and sourcing workshop for students and staff. The workshop started with a presentation discussing the fashion and textile industry’s devastating ecological footprint and social impacts, and how the materials industry is second only to oil in environmental impacts, as well as the number two polluter of clean water in the world. It was stressed that the industry’s over dependency a narrow range of material sources creates risk to the environment and supply chains, and looked at the lead taken by Kering in how we will need to think in a different way to be able to meet the global demand for our materials and textile fibres in the future. The workshop aimed to provide essential information around textile and leather production impacts, and focused on promoting the idea of ‘creative responsibility’, and urging designers to make more mindful materials choices, and to participate in the creation of socially and environmentally responsible supply chains. Some of the industry’s most urgent issues and obstacles were highlighted, discussing the need for creators of the future to be conversant with the impacts of the whole life-cycle of a product, in relation to principles of the circular economy. The students were then invited to become familiar with a range of ‘Skin’ type materials, and to study their sustainability criteria. The material selection included organic leather which have been vegetable and rhubarb tanned with sophisticated colour palettes from Dani and Deep Mello. There was great interest in the fashion led colours, prints and metallised effects presented by Atlantic Leather, an Icelandic tannery leading in manufacturing exotic leather from fish-skin which are waste products from the food industry, no fish used are endangered species. The fish-leather is produced from four different species of fish; Salmon, perch, wolffish and cod – each with its own unique characteristics – in a diverse range of colours, textures and finishes, all tested by the European Chemical Agency. The ‘wow’ factor of Nova Kearu’s post consumer food waste skins from the giant Brazilian fish ‘Pirarucu’ and ostrich leg leather created great interest. Nova Kearu has developed its own organic, chrome free tanning technology , based on a blend of biodegradable acrylic resins, polymers, synthetic & vegetable tannins which make a superior quality leathers free of heavy metals and environmentally safe. Skins tanned by Nova Kearu are sub-products of the food industry coming from sustainable management farms controlled and regulated by IBAMA which is the Brazilian Institute of Environment and Renewable Natural Resources. LCF Phd Flavia Amadeu creates rubber materials, and supports small producers and artisans from Amazon rainforest, whose economic activities are integrated with the use of sustainable natural resources. The coloured rubber represents a process of social innovation, which resulted from years of research, and has been responsible for generating social transformation and environmental preservation. Other materials featured tactile cork based onto a sustainable Lyocell backing, non toxic paper laminated on to sturdy denim and canvas by Paper Number 9, Waterproof and durable Pinatex pineapple leaf fibre, featuring new mirrored metallic coatings, BarkTex tree bark fibre, suede-like mushroom ‘leather’ Muskin, Japanese faux leathers from Ultra Fabrics, and brand new food waste technology Frumat faux leathers, utilising apple pectin. Thank you to LCC photography student Hazif Zainol.